Trump announces he will leave Intermediate-Range Nuclear Forces Treaty, signed between Reagan and Gorbachev in 1987. US President Donald Trump announced Saturday that he would be pulling out of the Intermediate-Range Nuclear Forces Treaty with Russia. "And I don't know why President Obama didn't negotiate or pull out. And we're not going to let them violate a nuclear agreement and go out and do weapons and we're not allowed to. We're the ones that have stayed in the agreement and we've honored the agreement,” he added. "But Russia has not, unfortunately, honored the agreement. So we're going to terminate the agreement. We're gonna pull out," Trump said of the agreement, which was signed in December 1987 by former President Ronald Reagan and former USSR President Mikhail Gorbachev. According to CNN, National Security Adviser John Bolton is expected to discuss the treaty with Russian officials on his trip next week. 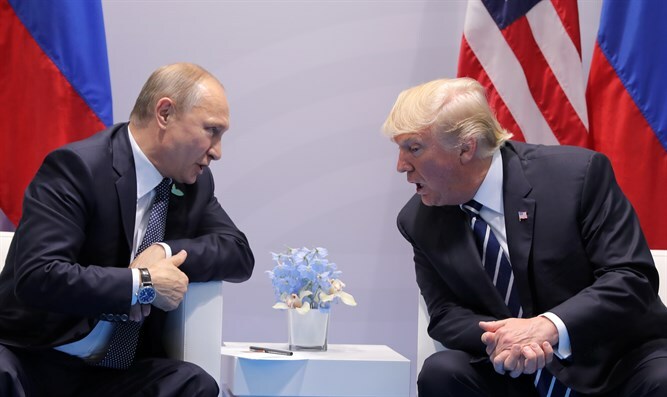 In March, the State Department accused Russia of developing destabilizing nuclear weapons in violation of its treaty obligations, after Russian President Vladimir Putin unveiled a new array of nuclear weapons. State Department spokeswoman Heather Nauert said Putin's speech showed Russia had violated its obligations under the Intermediate-Range Nuclear Forces treaty. In the speech, Putin revealed that his country had tested new nuclear weapons at the end of 2017 and said Russia tested “a new intercontinental ballistic missile that can reach any point in the world."